Bingham, Russell. "Shuvinai Ashoona". The Canadian Encyclopedia, 09 November 2016, Historica Canada. https://www.thecanadianencyclopedia.ca/en/article/shuvinai-ashoona. Accessed 20 April 2019. ​Shuvinai Ashoona, artist (born August 1961 in Cape Dorset, NU). Shuvinai Ashoona's art has been exhibited extensively, both within Canada and internationally. 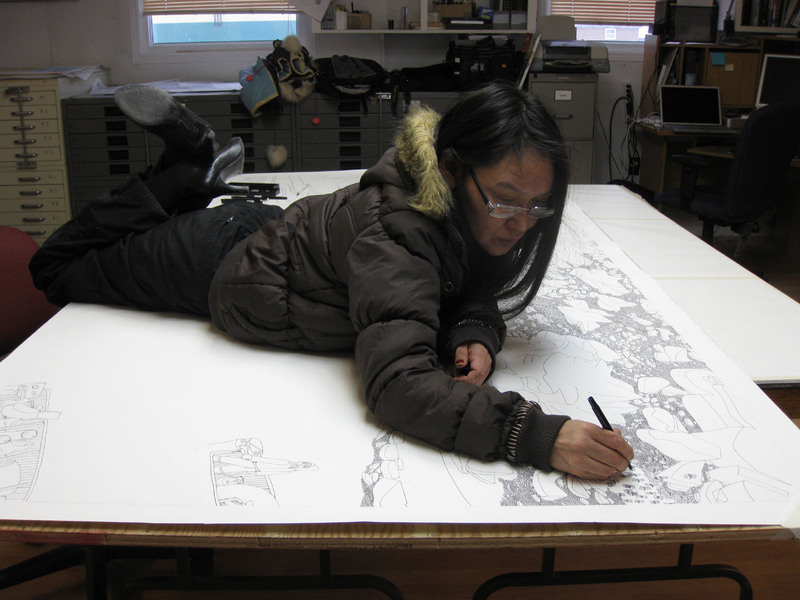 Inuit artist Shuvinai Ashoona drawing in the Cape Dorset Co-op (2008). Shuvinai Ashoona, artist (born August 1961 in Cape Dorset, NU). Shuvinai Ashoona's art has been exhibited extensively, both within Canada and internationally. Her drawings occupy a unique place within contemporary Inuit art, combining elements of Inuit culture and mythology with influences derived from contact with southern industrial society, all subsumed within the reality of her richly imaginative inner world. Shuvinai Ashoona was born in Cape Dorset on the southern tip of Baffin Island, home of the collective originally founded by James Houston in 1957 and the locus of a vital community of stone carvers and printmakers. Ashoona's detailed images readily lend themselves to transformation into prints, and in fact have occasionally been rendered as coloured lithographs and stonecuts. Her preferred medium, however, has been drawing which, with its fluid immediacy, is perhaps most sympathetic to the rapid expression of her own uniquely personal imagery. Her grandmother was the well-known graphic artist Pitseolak Ashoona. Other artists in her family include her mother Sorosilooto Ashoona, a highly regarded graphic artist, and her father is the carver Kiawak (sometimes spelled Kiugak) Ashoona. The Sobey Art Award–winning artist Annie Pootoogook is her cousin. Ashoona began making art in 1995, working with pen and ink, coloured pencils and markers to create very detailed images, primarily choosing as her subject matter the landscape of her native Cape Dorset. These early works realistically expressed the bleak northern tundra, with depictions of the spare vegetation, coursed by meandering streams and small waterfalls. The simplicity of the landforms and absence of distinguishing features contrasted with the elaborate detail in the drawings and revealed a unique artistic vision that set her apart from her peers working in the Kinngait Studios. 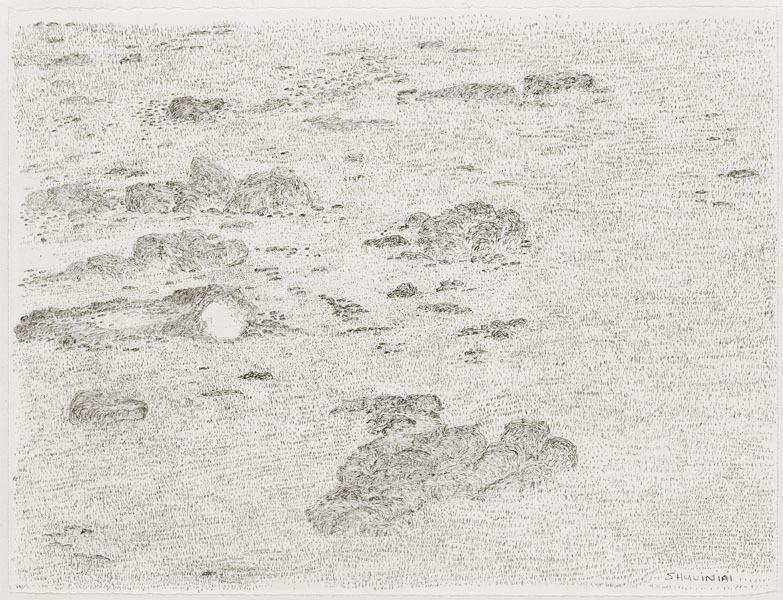 Typical of the drawings from Ashoona's early period are Low Tide (1994), a delicate arrangement of linear marks suggesting a bleak, almost featureless arctic shoreline, and Landscape with Grass (1996), an even simpler depiction of an arctic landscape in which the grass and rock formations are rendered by small, spare pen strokes. Notable about these early works was Ashoona's natural facility with mark-making, and her ability to conjure significant imagery out of the leanest of subject matter. 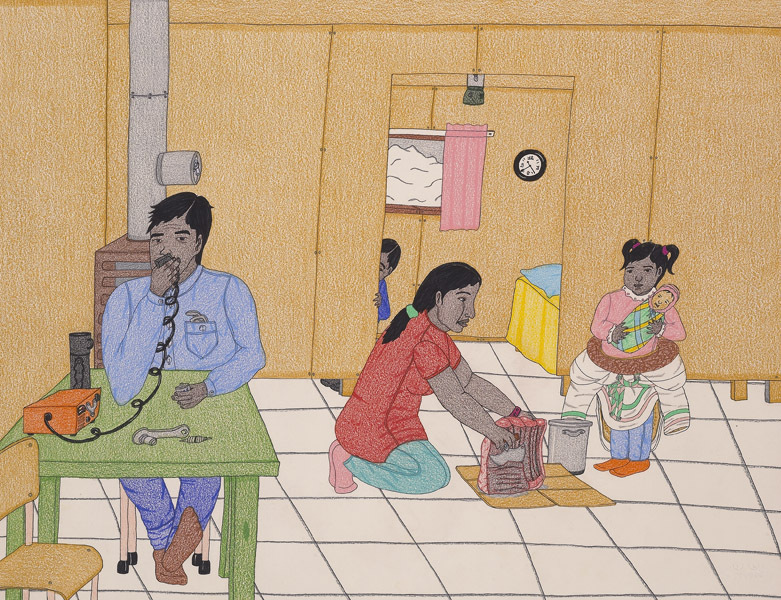 By the late 1990s, Ashoona's work had become darker, her inner world intruding on her straight depictions of the natural and social world of Cape Dorset. The more-or-less realistic rendering of the surface world began to undergo a transformation, with the artist introducing imagined subterranean landforms — tunnels and caverns — suggesting deeper, and sometimes menacing, possibilities. There is a sense in these works that the order and safe predictability of the natural world itself had been undermined by the intrusion of new, unfamiliar forces. Ashoona also began to expand her choice of subject matter. Like her cousin Annie Pootoogook, she began to focus on aspects of the new reality of Inuit life — the buildings, vehicles and technical changes of modern life. Often these were presented as straightforward representations as in works such as The Beautiful Brand New Water Truck (2006–07), with its daring off-kilter design that counterpoises the hulking form of the water truck with the snaking line of the bright red water hose. More frequently, however, the artist's works began to depict a composite world in which ordinary life in the North coexisted with strange and phantasmagorical images and creatures. Typical of Ashoona's mature work is Untitled (Eden) (2008), from the National Gallery collection. Rendered in coloured pencil, black ink and pencil, the drawing presents an unsettling combination of biblical narratives, meshing the reassuring story of the holy birth with the less happy Old Testament tale of the banishment of Adam and Eve from Eden. With its cropped-in, vertical arrangement of forms and passages of detail contrasted against flat sections of evenly applied colour, the drawing prompts strong associations with traditional woodcut printmaking. The composite Inuit/Christian imagery, however, adds a menacing strangeness that is powerful and unsettling. The fantasy elements in Ashoona's mature work often seem to draw inspiration from this conflation of northern and southern traditions and belief systems, but they also appear to be influenced by aspects of modern transnational popular culture. Ashoona is apparently a fan of contemporary horror cinema, and her art is an uninhibited expression of her willingness to draw from any sources that catch her interest. 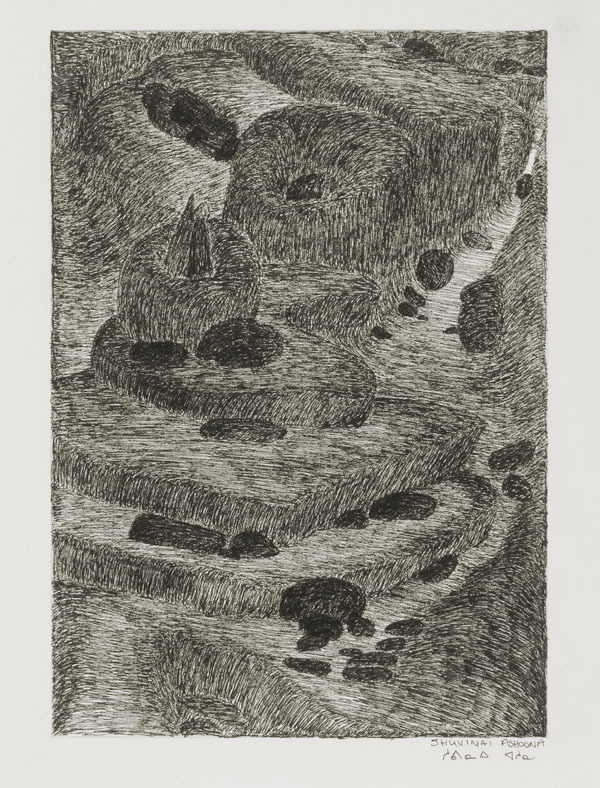 Shuvinai Ashoona's exhibition career began in 1997 when two of her small drypoint etchings were included in the Cape Dorset annual print collection. Her work was exhibited, along with that of her grandmother, the late Pitseolak Ashoona, and her aunt, Napachie Pootoogook, in the McMichael Canadian Collection’s 1999 exhibition Three Women, Three Generations. She was subsequently featured in several private gallery exhibitions, and in 2008 was profiled, along with Qavavau Manumie of Cape Dorset and Nick Sikkuark of Gjoa Haven, in the Winnipeg cultural magazine Border Crossings. She worked with Saskatchewan-based artist, John Noestheden, on a “sky-mural” that was exhibited at the 2008 Basel Art Fair and was shown again at Toronto’s Nuit Blanche in 2008 and at the National Gallery in 2013. She has also undertaken collaborative drawings with Toronto-based artist Shary Boyle. In addition, she was the subject of the documentary art film, Ghost Noise, produced and directed by Marcia Connolly in 2010. Other notable exhibitions include Shuvinai Ashoona Drawings, Carleton University Art Gallery (2009); Noise Ghost, Justina M. Barnicke Gallery, University of Toronto (2009); Monster, West Vancouver Museum (2010); It Is What It Is, National Gallery of Canada (2010–11); Inuit Modern: The Samuel and Esther Sarick Collection, the Art Gallery of Ontario (2011); the 18th Biennale of Sydney in Sydney, Australia (2012); and Oh, Canada, Massachusetts Museum of Contemporary Art (2012–13). Shuvinai Ashoona's works are represented in the collections of the Art Gallery of Ontario, the National Gallery and the Winnipeg Art Gallery. Shuvinai (Suvinai) AshoonaView a brief profile and portfolio for Cape Dorset artist Shuvinai (Suvinai) Ashoona. From the Spirit Wrestler Gallery website. Shuvinai Ashoona: Merged RealitiesView a selection of captivating drawings created by Shuvinai Ashoona from the Inuit Gallery of Vancouver. Shuvinai Ashoona’s 21st century style represents Nunavut as she sees itAn article about Shuvinai Ashoona’s preferred drawing style and an exhibit of her work at a gallery in Iqaluit. From nunatsiaqonline.ca. Sandra Dyck, on Shuvinai Ashoona and Ovilu Tunnillie (Dorset Seen)Sandra Dyck, co-curator of Dorset Seen, talks about Shuvinai Ashoona's drawing "Untitled (people lining up to sell art work)" and Ovilu Tunnillie's stone sculpture, "Ikayukta Bringing Drawings to the Co-op." A video from the Carleton University Art Gallery on YouTube. Ghost NoiseView a clip from a documentary about Shuvinai Ashoona, who is described as a “graphic artist whose meticulous sketches and drawings show her unique and sometimes disturbing view of Inuit culture.” From cutuppictures.ca on vimeo.com. Shuvinai Ashoona: Inuit feminism goes globalAn article about the symbolism expressed in Shuvinai Ashoona's art. From the Globe and Mail.